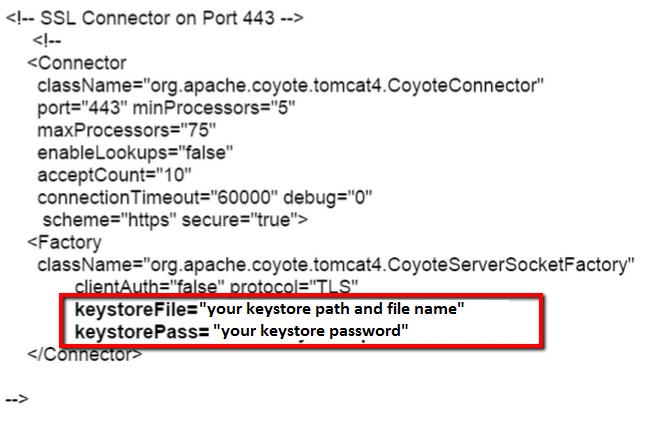 In order to install your JBoss Tomcat pkcs7 SSL certificate a into your keystore JBoss Tomcat system perform the following steps. If you had the option of server type during enrollment and selected IIS pkcs#7 Type: p7b you will receive a pkcs7/.p7b version of your certificate within the email. Alternately you can access your Certificate User Portal by the supplied link in the email to pick up the pkcs#7 version of your certificate. You will be prompted to enter the password to access the keystore. Note: During the import you might encounter the following error: Error: “java.lang.Exception: Input not an X.509 certificate.” or “Failed to establish chain from reply.” If you receive this it means that your version of JBoss/Tomcat keytool will not accept pkcs7/.p7b certificates and will have to proceed with the X509/.cer instructions instead. Below are Instruction on the X509 JBoss Tomcat installation.